A uniquely designed horizontal shed which would provide a fantastic compact storage solution for the smaller garden, those with less outdoor items to store or even as a secondary storage facility. 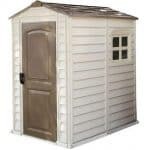 Made from a durable resin, this shed will be standing in your garden for many years to come. 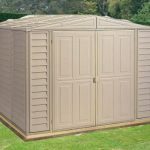 With attractive wood grain look, the Suncast Kensington Horizontal shed is a clever, functional design. The hard wearing resin means that it is maintenance free and weatherproof meaning that it will look good for years. With a durable 1-1.5” thick double wall construction and robust doors it is secure and safe, keeping garden equipment clean and dry. You can easily access everything from the top or the front such is the clever design and both the doors and lid can be locked for extra security. The floor is reinforced for heavy items and it comes complete with a shelf support. An optional shelf may be purchased to divide the horizontal shed into two smaller sections which is very handy if you have smaller outdoor and garden items and accessories to store. From bags of soil to hoses and watering cans, this fantastic storage solution has room for it all. Horizontal sheds are a compact alternative to the traditional garden shed, perfect for a smaller space or as a useful piece of secondary storage for your garden. As the horizontal shed may be a unique concept for some who haven’t seen this type of storage solution before, below the team at whatshed.co.uk identify and discuss features that make the Suncast Kensington stand out from a traditional upright shed. Exterior: Made from a strong and durable resin, the double wall construction adds yet another layer of protection for your items inside. 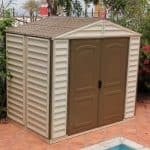 With a wood grain texture and coloured in shades of brown, this horizontal shed looks less like plastic and more like a natural structure that will be sure to blend into the background of your garden. 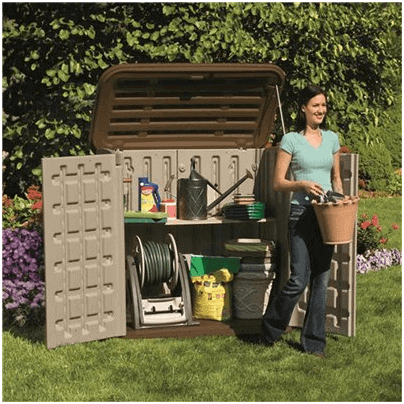 Interior: The fantastic 5x3ft interior is perfect to store all of your smaller outdoor and garden accessories such as tools, bags and pots. With the option of adding a shelf for further storage, everything can be neatly organised to provide them ultimate storage solution for those items that may get lost in a larger or taller shed. With a strong floor, holding those heavier items is not a problem and it provides a sturdy base meaning your shed will not move at all. Doors: With three opening doors finding and accessing your items couldn’t be easier. Robust doors and a hands free lifting lid with prop mean that access is available both from the top and with double doors to the front. The Billyoh Suncast Kensington 4 Horizontal Shed: How easy to build? Given the smaller size of the Suncast Kensington we expect that it could easily be assembled within a couple of hours. 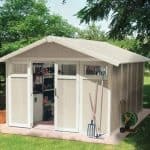 Again, due to size we feel that this particular shed could be assembled by an individual because of the smaller size of the parts, low height and simple design. Your package will contain everything you need to build your shed apart from a basic set of tools which you will need to provide yourself. A full set of instructions is provided giving you a step by step guide in which to follow. 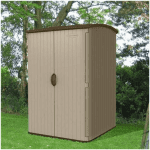 The Billyoh Suncast Kensington 4 Horizontal Shed: What is the overall quality like? There’s no doubt about it, Billyoh really do know what their customers need and want from a great garden shed or similar storage building. This maintenance free shed is both hard wearing and weather resistant, meaning that this is great for those wanting an easy storage solution for their garden. The double walled plastic gives the shed a sturdiness and strength and combined with the robust double doors means and tough plastic lid, your items will be secure and protected from the elements. The benefit of a resin finish is that your shed will not peel, discolour or dent, making sure that its smart appearance lasts for the duration of its useful life. The Suncast Kensington is maintenance free however should it require a clean either hose it down with water or sponge clean by hand with a soapy solution for that extra sparkle. 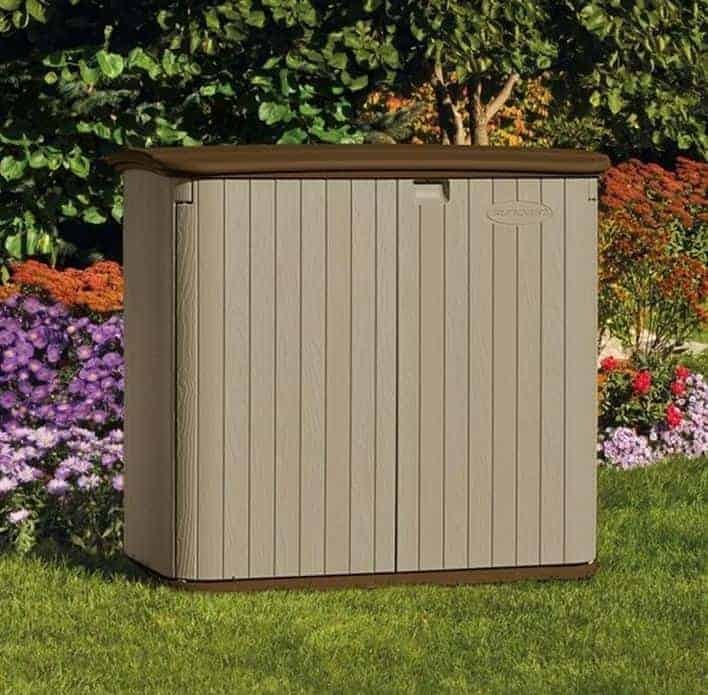 If you are seeking a smaller storage solution for maybe a smaller sized garden or to fit into a compact space then the Suncast Kensington could be the perfect shed for your needs. At this great price you can have it all – style, strength, durability and an organised storage interior. You will have peace of mind knowing that your outdoor and garden equipment will be protected all year round from the elements and damp, rust, rot and mould.